As the name states, writing styles is the way a writer chooses to express himself/herself through a piece of writing. But what exactly would be a writing styles for RC? Well, just like each one of us has a unique dressing style, so does CAT RCs differ in the way they are written. And just like you dress differently for different occasions and places, so does a passage is written according to its purpose, audience and context. But the question is why it is important to identify the writing style of a passage? Now, let’s see how can you identify each writing style and devise your RC strategy accordingly. While reading the passage, try to extract the underlying message that the author wants to convey through the story. Also, the tone of the author will help you understand the emotions he/she is going through while narrating the story. Both direct and indirect questions may be asked from these passages. A good idea for such passages is to go through the questions before reading the passage. This will save time and help you spot the required answers easily since most of the questions asked from these passages are direct. Do not get distracted by figurative language used in the passage. Instead, try to stay focused on understanding the contextual meaning and answer the vocabulary based questions accordingly. Facts and figures may tend to confuse you, so focus on the main points and purpose of the passage. Here also, you are advised to glance through the questions before reading the passage. This way, you will be able to make mental notes of the crucial information needed to answer the questions. Most of the questions asked are direct and require you to identify the key points. g. key features of a scientific report/research. Understand the author’s point of view regarding the subject being discussed. This way you will also be able to comprehend the implicit information and answer ‘the author agrees/disagrees’ questions well. This style of writing often uses continuity words like ‘in the same way, likewise, additionally,’ These serve as an indicator of the examples used by author to justify his/her stand. Identify the central theme of the passage and the ideas build-up around it. 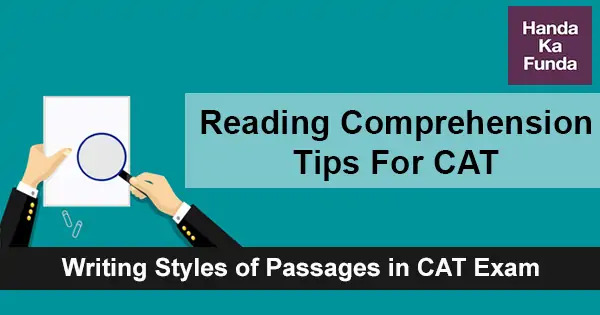 In these passages, you will frequently come across contrast words like however, nonetheless, despite, but, Such words are used to present arguments and counterarguments on the given topic. Focus on the relevant points and do not focus too much on minor details. You are likely to be asked inferential questions from such passages. So, try to formulate your opinion while reading the passage. A good idea to master such passages would be to read about latest happenings and discuss it among your friends so as to analyse from various aspects. Look for the tone and structure of the passage to figure out the author’s message in the passage. Such passages may appear complex and demand a second reading to understand their essence and meaning. Finally, you need to invest a good amount of time on reading from variety of sources like newspapers, magazines, journals, etc. Putting it another way, try to inculcate the habit of diverse reading so as to improve your comprehension skills and get well-versed with various writing styles. In case you have just started with RCs, make notes of the important points while reading the passage. Begin with solving 2-3 RCs daily and identify the writing style for each. As you increase your practice, you will be able to make mental bookmarks of the main ideas given in the passage. Also, practicing RCs from previous year CAT papers and mock tests will enhance your accuracy and speed in exam.